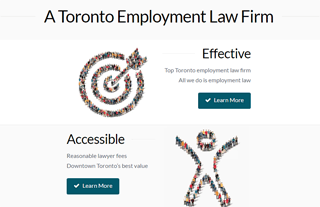 Dutton Employment Law is a top employment law firm practicing in downtown Toronto and across Ontario. Our employment lawyers are regularly sought out by employees and management from FP 500 companies to provide employment consultation, advice, negotiation and litigation services in all employment law matters in all industries. We have high-level experience and expertise, with boutique customer service and value. We rely on specialization in employment and labour law only to provide the highest quality workplace legal advice.